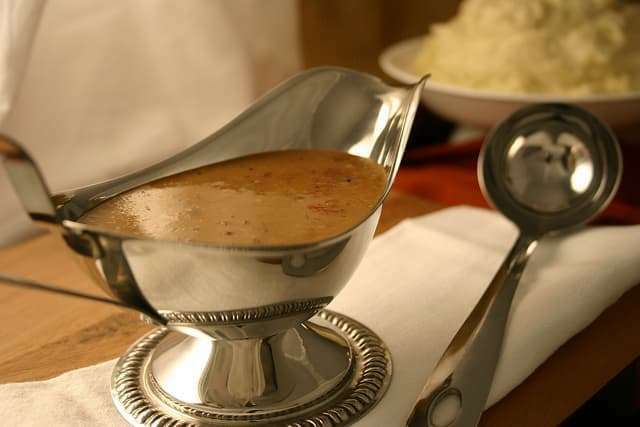 Gravy, it is one of those Thanksgiving staples that makes almost every traditional Thanksgiving dish a little tastier. Gravy is a friend to every morsel in the feast, it is not, however, a friend to carpet and upholstery. When gravy is flowing and it ends up on the floor the best thing to do is get to it as soon as possible with the following cleaning steps. First- Get as much of the excess gravy as possible off of the carpet. Start with a paper towel or clean white rag/cloth and let it soak up as much gravy as possible. Second- Apply an all-purpose stain remover and cornmeal or baking soda. The cornmeal or baking soda will help to absorb the gravy out of the carpet. Let it sit for about 15 to 20 minutes or until you feel it has plenty of time to absorb the gravy then vacuum. Third- If there is still some gravy left behind in the carpet grab some dry cleaning solvent and a clean white rag or cloth. Apply some solvent to the stain use the cloth to gently blot working from the outside edges of the stain in toward the center. This helps to keep the stain from spreading further into clean areas of the carpet. Use clean areas of the cloth and continue to blot until the gravy is no longer on the carpet or is no longer absorbing into the cloth. Is the stain still hanging on to the carpet? Tackle that hopefully now faint brown stain with a solution of one tablespoon hand dishwashing soap, a tablespoon of white vinegar, and two cups of warm water. Take a new clean cloth or sponge and blot the stain with the water and soap solvent. Blot until no more stain remains. Tip- follow up any spot cleaner with a rinse of fresh clean water, the solvent residue will attract more dirt. Make sure to remove as much moisture from the carpet as possible when you are finished spot cleaning. Note: Always test any new spot treatment cleaner on an unseen area of carpet to make sure it will not have any adverse effects on your floor. The best place is on the floor of a closet or corner of a room. If after all your valiant efforts to save your carpet from the gravy, it is still stubbornly holding onto your carpet fibers call in a professional carpet cleaner. After the party is over, the guests have gone home, and the leftovers are all tucked neatly into the fridge in food storage containers, make an appointment with the experts at All Kleen. We have a friendly team of trained cleaners with an arsenal of stain-fighting tricks to get your carpets like new again.